Which comes first: traffic restraint or mass transit? Jakarta's core corridor with both TDM and BRT. Neither is perfect but both are steps in the right direction. The green sign reads "zone for cars with three occupants or more"
and refers to the so-called Three-in-One policy. Hundreds of growing cities across Asia, Africa, the Middle East and Latin America are motorizing rapidly. Unlike large Western or Japanese cities when cars first flooded them, today's developing cities are mostly facing this onslaught without the safety valve of a large pre-existing rail-based mass transit system. This makes traffic growth a huge challenge. Most are trying to expand roads and to build mass transit but can't keep up with demand that is exploding. Meanwhile workhorse bus-based public transport deteriorates, due especially to traffic delays. Slowing down the rate of traffic growth seems essential. But transport demand management (TDM) policies, such as congestion pricing or increased parking fees, tend to be difficult to sell politically. This post looks at just one of the objections to TDM and offers an anecdotal counterexample. A common objection to TDM that I have often heard in developing Asian cities says "we can't restrain traffic until our city has a world class mass transit system!" or words to that effect. I have heard it from time to time in India, Malaysia, Thailand and Indonesia. I am sure it appears in many more places. Mass transit in this objection means urban rail, such as metros or MRT or sometimes LRT. It could conceivably mean BRT but I have not come across any TDM opponents who call for busways to be built before traffic is restrained. Is this objection a good argument? Is rail-based mass transit necessary or could humbler improvements to public transport be enough? A look at the contrasting responses of Singapore and Kuala Lumpur might help. Kuala Lumpur's decision-makers have repeatedly contemplated policies to restrain private car travel to the city centre. And repeatedly they have deferred a decision, saying such policies would only be possible when the public transport system improves. This happened first in the late 1970s, when KL almost implemented a central cordon traffic pricing scheme much like Singapore's. The gantries had actually been build before the scheme was aborted at the last minute. At first glance, this rejection might seem fair enough, since the main commuting alternative at the time was a rather moribund bus system supplemented by new minibuses. However, the same argument keeps appearing no matter how large KL's urban rail network becomes. I have heard it at regular intervals since the mid 90s. By then KL's rail system had started to open, so the question arose, can we restrain traffic now? But the public transport improvements never seem to be enough. There seems to be an unfortunate cycle in KL. When each round of expressway building fails to stem congestion TDM proposals emerge from time to time. For example, in the late 1990s higher city-centre parking fees were proposed. More recently there has been mention of congestion pricing of some kind. Each time, City Hall (Dewan Bandaraya Kuala Lumpur) and the Ministry of Transport consider the proposals and talk to the media about them. In the resulting furore people inevitably point out how ineffective and crowded public transport is ... and the idea is shelved until public transport improves. Many transport folks from motorizing cities are well aware of Singapore's strong efforts to restrain traffic. But most of them seem to assume that this was possible because Singapore has a wonderful mass transit system, the MRT. But the MRT system opened in 1986. Singapore's aggressive TDM efforts began in earnest in 1974 or so! 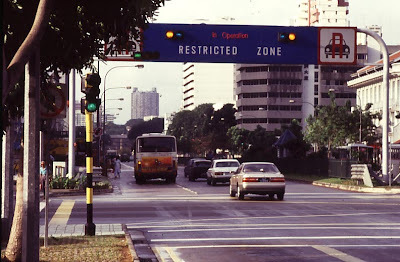 Singapore did make significant improvements to its bus system, including bus lanes, at the time that it introduced its traffic restraint reforms in the mid-1970s. Singapore did not wait for MRT. In fact, the bus system had only just been beaten into some kind of decent shape and few saw buses as a good alternative to cars. it was transformed into Electronic Road Pricing (ERP). The left lane here is a bus lane. I think causality in Singapore probably ran the other way than people assume. Having strong TDM early on was a big factor allowing ridership to grow on its bus-based public transport and allowing the creation of public transport-oriented land-use patterns. By the time MRT finally came, it was assured of a mass market. By contrast, by the time KL got an extensive rail system over the last 10 years, most of its residents already had cars and motorcycles and had organised their lives around private transport. KL's rail systems are popular but sadly urban rail has not transformed the modal split in favour of public transport. Nor has the mass transit system eased congestion in any obvious way. Of course, restraining traffic is as much a political question as a technical one. And you might say Singapore has an unfair advantage because of its less-than-boisterous political system. Perhaps. The Singapore story does show that there is no technical reason for demand management to wait for high-quality mass transit. And Kuala Lumpur's experience shows that if you wait for mass transit to be good enough before you do any TDM, then you will probably be waiting for ever. It is true that traffic restraint measures must usually be paired with visible improvements to alternatives or they will not fly politically. But traffic restraint policies need NOT wait for rail-based mass transit. In fact, traffic demand management may be a great way to prepare your city for success with mass transit.